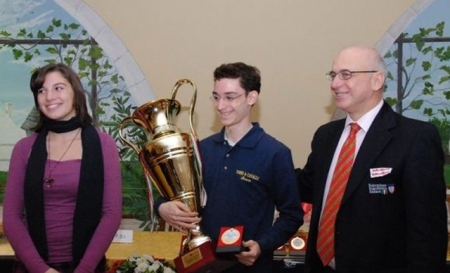 Fabiano Caruana, the strongest Under 16 chess player in the world, won the 68th Italian Chess Championship, held in Martina Franca (Taranto, Southern Italy) from 3rd to 14th December. This is his second title in a row. 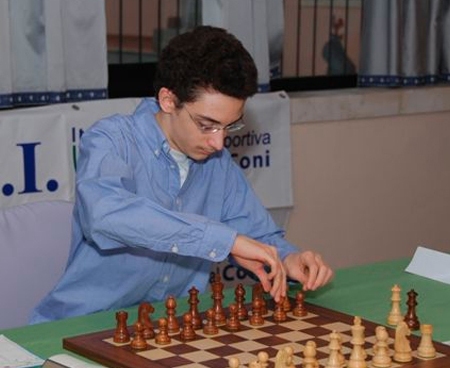 This year Fabiano had to fight harder than he did in 2007 to gain the title: after getting off to a flying start with four wins and one draw, Caruana lost in round 6 against FM Alessio Valsecchi, a promising 16 years old chess player from Bergamo. The next day, in round 7, Fabiano run into an unexpected loss again with IM Daniele Genocchio. At this stage, Fabiano reacted and played as a big champion, going back to the highest ranking, but his effort wasn’t still over, because in round 11 he had to face 41 years old GM Michele Godena, who was just 0.5 points behind him. Godena tried to gain the game and the title, using for the very first time in his carrier the Dragon variation of the Sicilian Defence. 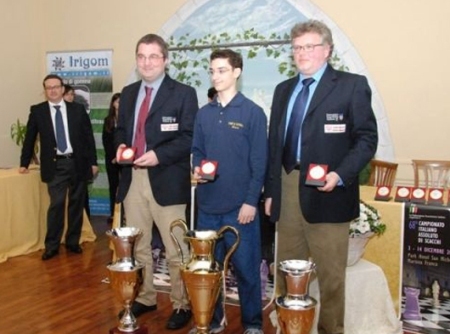 It was a very hard fight, which ended with a draw and the win of the title by Fabiano Caruana. His final result was 8 points on 11, with 7 wins, 2 loss and 2 draws; Godena was placed 2nd with 7.5 (4 wins, 7 draws and no losses). They were followed by IM Fabio Bruno with 7, IM Sabino Brunello and IM Pierluigi Piscopo with 6, IM Daniele Genocchio and IM Denis Rombaldoni with 5.5, FM Alessio Valsecchi and GM Carlos Garcia Palermo with 5, FM Daniel Dvirnyy and IM Luca Shitaj with 4 and IM Daniel Contin with 2.5. Now Caruana is a world-famous chess player. That is the reason why Fabiano, who is a member of the Torre and Cavallo Chess School of Brescia, has been invited to take part to some of the most important upcoming chess tournaments: he will be in Pamplona, Spain, from 22nd to 29th December. Then from 16th January to 1st February, Fabiano will play the Corus B torunament in Wijk Aan Zee, Netherland, where early this year he won the Corus C tournament. If you wish to have more information about Italian Chess, you can check www.messaggeroscacchi.it (Italian) or contact us at redazione@messaggeroscacchi.it. 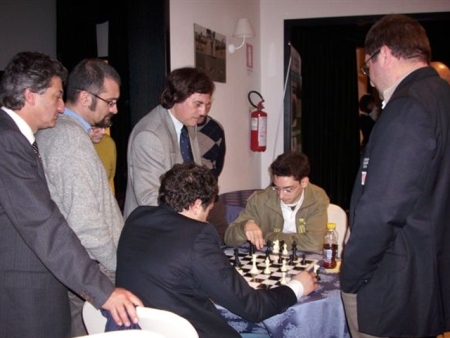 Fabiano Caruana is a card-carrying member of the Torre and Cavallo Chess School of Brescia, where publishing house Messagerie Scacchistiche has been established in 1990. Messaggerie Scacchistiche publishes the monthly magazine “Torre and Cavallo Scacco!” – “Rook and Knight Mate!” in English – and is run by former Italian Chess Champion IM Roberto Messa.